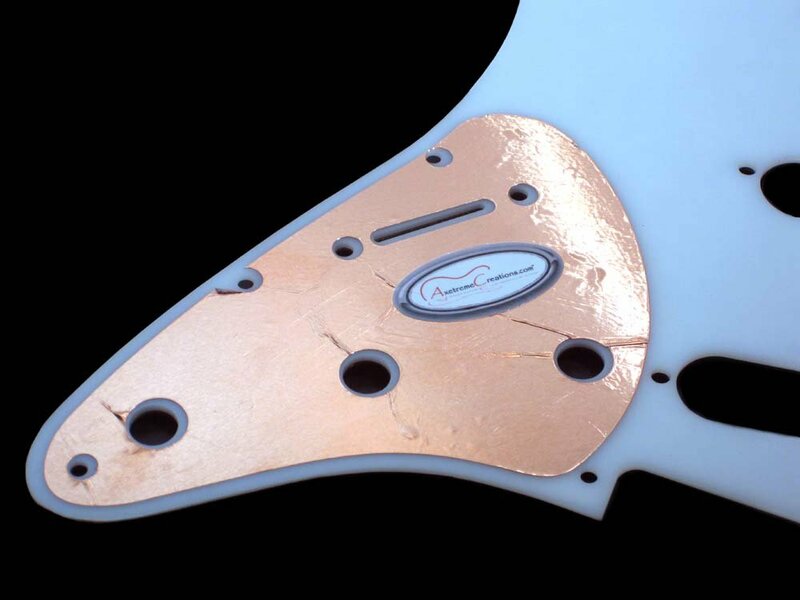 What do copper shielded pickguards do to Strat Tone? Discussion in 'Guitars in General' started by still.ill, Apr 30, 2016. Does it reduce hum or anything? Will the tone change in anyway-- -less highs? Probably reduces hum a little provided it's grounded. Doubt it will help with hum but might help with buzzy type noises...but also has the potential to roll off the highs a bit with the shunt capacitance. That spot of foil is what grounds the Pots. it does nothing that any of us would be able to identify should the opportunity to participate in some sort of comparative analysis... nothing... the purpose of the foil is to shield the electronics from spurious external interference that can cause various types of noise. derekd, Silver Hand, macmax77 and 1 other person like this. I believe it is there as a matter of habit. Take it off and you would never notice it was gone. The type of hum and buzz you get is from the electrical source or lights mostly. The big coils called pickups are a major reason for it and no way to shield those. I am not in the shielding camp as if it was not obvious. Shielded too many with essentially no difference, just usually changes the frequency of the noises is all. macmax77 and ant_riv like this. I could hear no difference when I shielded mine. I Like the tone of shielded Tele's and Strats, but that means copper foiling all of the cavity as well of the back of the guard. Little patches like that add continuity to the pots. that's where teh toan lives! rufedges and Jess 1971 like this. Who cares what it sounds like, it's not vintage correct! If I take mine apart for any reason I shield the cavity and the entire back if the pickguard. It does not affect the tone. It has the potential to reduce EMI related noise. No effect with aluminum, I doubt it with copper. Chris, was this with a fully-shielded cavity? Hum should still be there, but the hiss should be much lower. I get better results with aluminum as copper does little to stop the noise of dimmer switches and other electronic noises coming from computers, etc. That said I do not do much to shield my personal guitars other than making sure there are no ground loops and static from the pickguard is grounded. My house is an RFI nightmare. I would cut the head off a chicken, sprinkle blood in a circle and recite ancient incantations during the dark of the moon if I thought it might reduce the noise I get even a little bit. So I shield my guitars, even though as observed, it apparently doesn't manifest in tangible and noticeable differences... YMMV. Does shielding just the control cavity with copper tape cause a change in tone? I've done two Les Paul's and one I noticed no change but in my Traditional LP I can't tell if it was the pickups I put in at the same time. I didn't shield the pickup cavities and won't. They color it kind of thin, shiny light brown. Don't let anyone tell you otherwise! copper is a somewhat better conductor than aluminum, if either one does anything to reduce noise the copper will do it a little better. Shielding a pickup can affect the sound because it can change the magnetic field, but you (generally) don't need to worry about control cavity shielding affecting tone. Shielding is used to block/absorb interference. This interference is likely the noise you hear from your guitar when not playing if your pickups are hum-cancelling. A small patch like in your picture is 'kinda' effective. If you want to get serious, paint the cavity with shielding paint and use hefty copper to create a little Faraday cage (blocking the interference from all directions). To my ears, it doesn't change the tone but it does reduce noise.